Not a student yet? Apply. 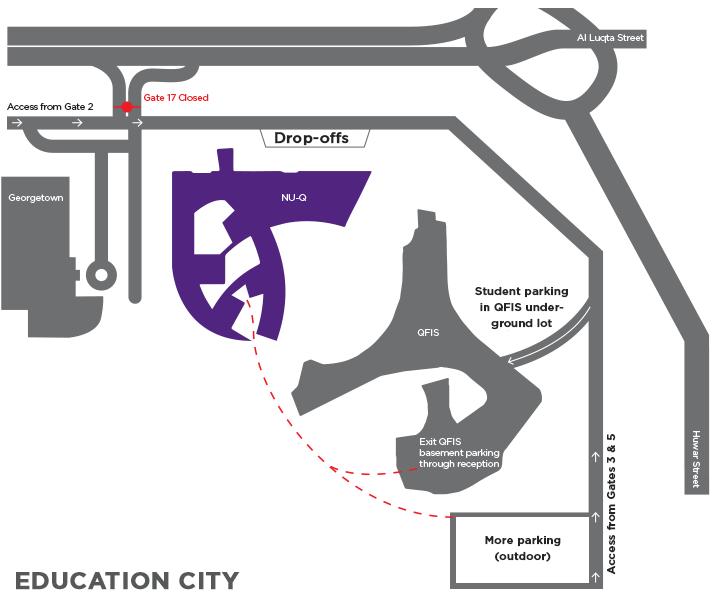 Students may park in the QFIS Parking, where there is signage to guide you to the NU-Q South Main Entrance. Please do not park in the QFIS Basement Car Park. There are regular Qatar Foundation Shuttle Busses (look for the yellow busses) that pick and drop off from this car park to the NU-Q Building. Visitors may park in the QFIS Parking, where there is signage to guide you to the NU-Q South Main Entrance. Visitors with disabilities will be given access to the NU-Q basement parking lot, where elevator access to all floors is available from there. NU-Q faculty and staff may park in the NU-Q basement lot. Free shuttles run between Education City campus buildings every 5-10 minutes from 6:45 a.m. - 9:00 p.m., Sunday through Thursday. Shuttles run between the Residence Halls and the Recreation Center every 30 minutes. The shuttle picks up at the north entrance of the NU-Q building. Look for the yellow QF bus. A free employee busing program organized by Georgetown University in Qatar runs between various Doha residences and Education City. Shuttle vans pick up at the compound clubhouses and in front of the towers' main entrances. Drop off and pick up by shuttle busses will be at the North Main Entrance under the canopy. Please remember to have your NU-Q ID card visible for security. Drop off and pick up by family, drivers etc. will be at the North Road lay-by, which is a strictly no-parking area. QF has instructed their guards to report parking violations to the Police via METRASH. Any driver who does not have their pick up ready may be asked to leave, drive around, and return so as not to block this area. Request short-term parking for equipment pick up and drop off is available on Webcheckout at https://webcheckout.qatar.northwestern.edu/webcheckout/pir/login. Log in using your NetID and password and select: Production Locations – Equipment Cage Parking. Your vehicle plate registration number must be detailed in the notes section of your reservation. Failure to adhere to this will result in a parking fine issued by the Ministry of Interior. Maximum parking is 30 minutes and parking is only permitted during production equipment cage operating hours.